THE MAYBELLINE STORY : Maybelline founder Tom Lyle Williams believed in a strong work ethic before having fun. Maybelline founder Tom Lyle Williams believed in a strong work ethic before having fun. Tom Lyle Williams with Sallee Allen, Emery Shaver, his niece Annette Louise Williams (Corbett) (his brother Noel and Frances Williams second child) and Arnold Anderson in front of the Villa Valentino in the Hollywood Hills, 1945. Annette Louise Williams, Tom Lyle's brother Noel's, second daughter worked for the Maybelline Company as a secretary for many years - one of the few cousins who ever worked for the company for any length of time. As a young girl Annette learned the value of having a strong work ethic from her uncle Tom Lyle and her father Noel, the two brothers who built the Maybelline Company from the ground up. But when she and her cousin Salle Allen, visited her uncle Tom Lyle at the Villa Valentino in the Hollywood Hills Annette also learned the value of playing hard as well. Dinners at The Brown Derby, a boat trip to Catalina Island and tickets to Grauman's Chinese Theater were special treats for visiting relatives from Chicago and though Annette may have worked hard at the Maybelline Company- in California she learned to kick up her heals and have the time of her life. Working hard was a common thread that ran through Tom Lyle's life and he passed that value on, to all his nieces and nephews. He believed that when there's a job to be done, fun must be put on hold until it's finished, but when the work is done, there's no limit to the fun that can be had. 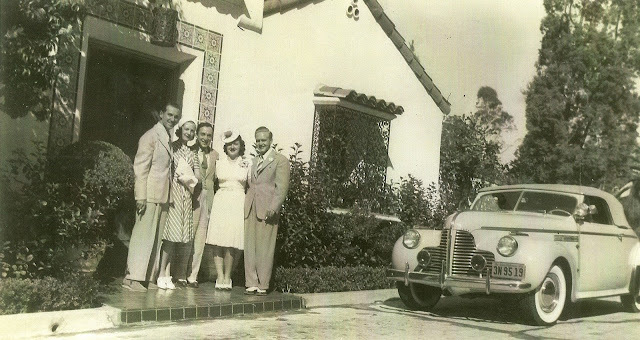 No wonder once the Maybelline Co. sold, Annette, with her husband and daughter, moved to Montecito, Santa Barbara, California, and never looked back. Like Tom Lyle, she couldn't resist the sunshine, beautiful beaches and laid back lifestyle that came with living on the Gold Coast. Read more about Tom Lyle's dedication to hard work that made the Maybelline Company the most successful cosmetic company in the world.